I got my permit to sell art on Jackson Square. Getting this permit means Ill be able to support myself by selling art. Coming out of grad school in 2012 I had my sights set on selling art in the French Quarter of New Orleans. 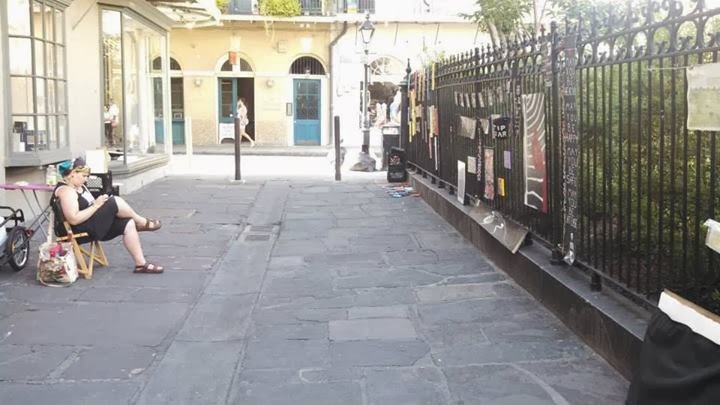 I was able to get a Pirate Alley Permit and spent the last year setting up paintings on the fence behind St. Louis cathedral and selling to tourists and locals. My Pirate's Alley studio. Taken by Nick Campion. While I am deeply fed by compliments that my work was "blessedly not derivative", "the best thing they has seen in the French Quarter" or simply "sweet and charming" I was financially scraping by and had a few side jobs to fill in the gaps. However, I learned a lot being on Pirates Alley. 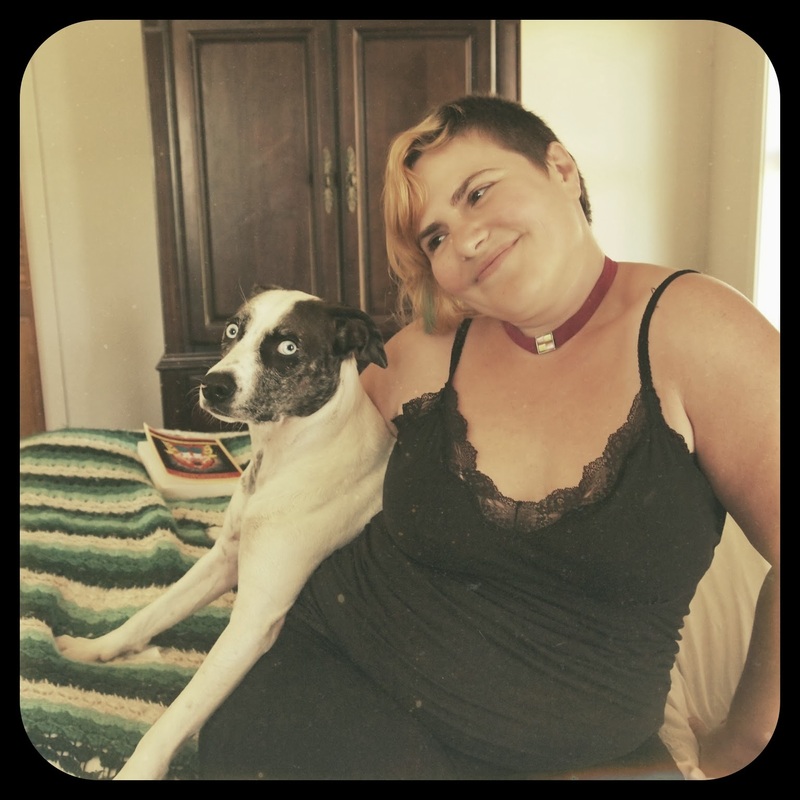 It took me months to become comfortable selling my work and figuring out the kind of set up I would need and how to get it all down there with a bicycle. This space became my outdoor studio and I was able to invite anyone walking by into my world. People bought my work to display it in the most exclusive places in the world...their homes. But at the end of the shady and damp alley the sun would be shining on Jackson Square. There artists were selling up to three times as I was due to the higher foot traffic. Even though multiple tour guides would leads their herds down my alley touting its "pirate-y” fame the general consciousness was that the "real artists" set up in Jackson Square. I became hungry for one of the 200 Jackson Square permits and was ready to jump at the chance at the start of February when any non-renewed permit would become available on a "first come first serve" basis. "This year, the permitting process did not go smoothly. The original deadline fell on Monday, Feb. 3, not long after the late January freeze scare that closed City Hall for two days. Because of the unexpected closure, the Bureau of Revenue wasn’t ready to issue permits at the appointed hour of 8 a.m. on that Monday. The artists who were unaware of this and had lined up the night before were turned away. Despite the inconvenience, the artists lined up again, hours and hours before the new Feb. 5 deadline. Or was it the March 5 deadline? The city had announced that the sale would be held on both dates. The artists assumed the March deadline was a typo. They were wrong. Once again they were dismissed. The city then scheduled the sale for Feb. 12, without giving any special consideration to the artists who had already waited in line twice. Some of the hopeful were forced to drop out due to family and job responsibilities. " With the new date of 2/12/14 seemingly secure I tried to go to work on Pirate's Alley on Sunday 2/9/14 but the rumor soon arrived that 4 artists were already camped out in front of City Hall. I had planned to go over there on Monday morning and was already dreading spending 2 nights on their stoop but I found myself unable to think of anything but claiming my spot in line ASAP. 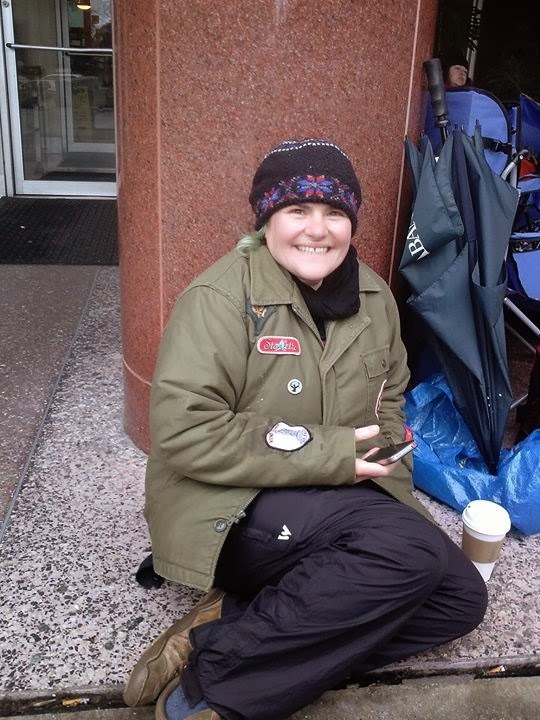 So I took a deep breath, grabbed my sleeping bag and headed to City Hall for a 3 night camp out and became #9 in line. Sunday night into Monday was charming as the weather was warm and dry. The 12 or so artists who had showed up were in high spirits. I felt like I was on a retreat where the only thing I was required to do was not leave the general area for more than an hour. Otherwise we all hung out and talked about life and the art we make. I'm grateful to have had time to inquire into the people behind the art. When I'm out working it's all too easy for me to stay focused on creating and selling my work. Some of the artists were people I has spent the last year around and some were new to me. It was a great opportunity to feel out my new coworkers and make friends. Monday night it got cold and Tuesday was even colder...and rainy. We each had our number in line written on our hands and had a numbered list of names and phone numbers which was updated as people arrived. There were group meetings to keep us all on message concerning how long we could leave the line and maintain our space, discuss strategies in case people tried to cut in line or became aggressive and did our best to communicate clearly with City Hall officials, security guards and the variety of press people who came by to get our story. A lot of people took time to show their support and offer solidarity. The owner of Forstall Art Store brought us doughnuts, some current Jackson Square artists brought us a gas heater and food, others brought sandwiches and water and some employees of City Hall even gave us a king cake. And we waited, drank coffee, wine and whiskey for warmth and smoked way to many cigarettes. I played on my ukulele at night and did yoga during the day to keep my body and voice open and moving during this ordeal. Blessedly on Tuesday night the security people let us sleep in the lobby because the temperature was dropping below 40 and the rain was steadily coming down. I stayed awake all night as I was too hyped up by my nervous excitement about the impending permit time to rest. Wednesday morning finally arrived and at 630am we organized ourselves and our belongings into some kind of order, by 730am we were sitting in chairs lined up in the hallway outside the permit office...and by 830am I had my new permit in hand! I'm so glad it's over and so excited about the expanded opportunities now on the horizon for me and my expanded community of artists. My art hanging on Jackson Sq 2/14/14 with St. Louis Cathedral in the background.